Audi recently gained the eyeballs by unveiling its Audi R8 Coupe V10 Plus Selection 24h 2016. The model looks fabulous with its sporty stance while the elegant integrations inside out make it look luxurious. The very first look of the model will make an invincible space in your heart, further making the R8 Coupe a model for lifetime. 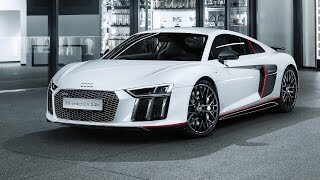 Let us have a look at the review of Audi R8 Coupe V10 Plus Selection 24h 2016 to know in detail about it. The interior of Audi R8 Coupe V10 Plus Selection 24h 2016 is also awesome as the car is. The interior will present a luxurious and standardized arena with enhanced features. The upholstere leather comes in rotor gray color, Alcantara headlining while the gloss-finish carbon fiber reinforced plastic (CFRP) over air vents and extended inlays for the surrounding of the Audi Virtual Cockpit makes the model worth all the penny. There is also a "R8 24h" logo above and illuminated door sill trims at the bottom while the serial number from 1 to 24 for each of the limited-edition R8s makes it further special. Talking about the technical package it has dynamic steering, adaptive damper control, magnetic ride and laser lighting. It also provides the comfortable sportier sitting to the driver for better riding and focusing. The entire interior of Audi R8 Coupe V10 Plus Selection 24h 2016 is superior and fantastic. The exterior of Audi R8 Coupe V10 Plus Selection 24h 2016 is as amazing as the interior, it can impeccably pop your eye-balls out of amazement. Starting with the front fascia it has an aggressive and dynamic look. The first thing to grab your attention is the engine compartment cover followed by rear wing, diffuser, front spoiler, and the exterior mirror housings of the model are made up from glossy-finished carbon fiber. Moving towards sides, the side skirts are matte-finished and feature an “R8 24h” logo which is superior to watch. At the rear end the outlets on the sport exhaust system now feature black trim, and the car rolls on 20-inch forged aluminum wheels. Those wheels, by the way, come in a 10-spoke Y design and are finished in gloss anthracite black. The red accents stand out against the white finish on the body which is fabulous to view. One can say, that Audi R8 Coupe V10 Plus Selection 24h 2016 is having fantastic exterior. The Audi R8 Coupe V10 Plus Selection 24h 2016 is powered with 5.2-liter V10 mid-engine. It offers the power of 610 hp and the peak torque of 540nm. The car can knock 0-62 mph in just 3.2 seconds and can run with the top speed of 205 mph. The car sits on 20-inch forged aluminum wheels, with a 10-spoke Y pattern. . A newly developed quattro drive distributes its power fully variably between both sets of wheels. 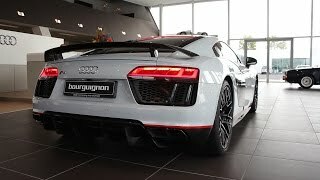 That makes Audi R8 Coupe V10 Plus Selection 24h 2016 the both the fastest and most powerful production Audi of all time.